Even fall rains can't get Ted and Nancy Dobson's garden down. This tiny, magical space only gets better with age and the careful attention of its inhabitants. Readers familiar with the space through garden tours or the journal may note the beautiful new water feature at right, one of the Dobson's summer projects. Stunning, isn't it? It seems that we're not the only ones who love this intricate and collaborative space, and you may get to see this fabulous garden in print soon (more details to come, of course)! 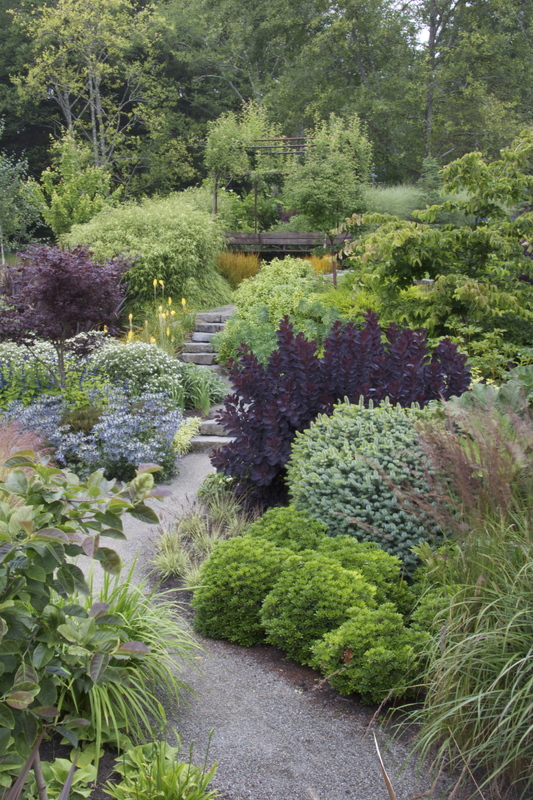 While photos may be worth a 1,000 words, a visit to this garden speaks volumes. 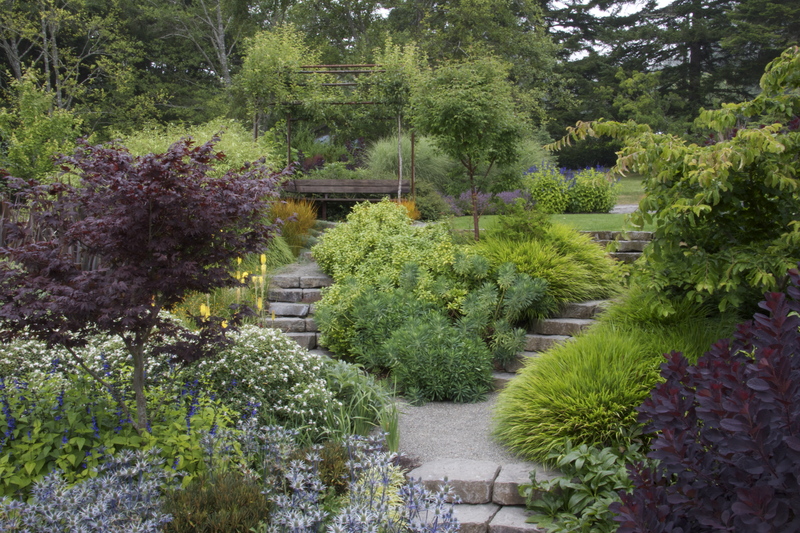 The Dobsons' garden (and several of our other gardens) will be on the tour for the Hardy Plant Study Weekend next June 7-10, 2012. Save the date and stay tuned for more information! More Dirt on our Gardens! While we've been working away in Salem, of all places, two more of our gardens have put in an appearance on Sunset's Fresh Dirt! These shady gardens are just a short hop apart in the Fairmount neighborhood, but they have dramatically different styles. 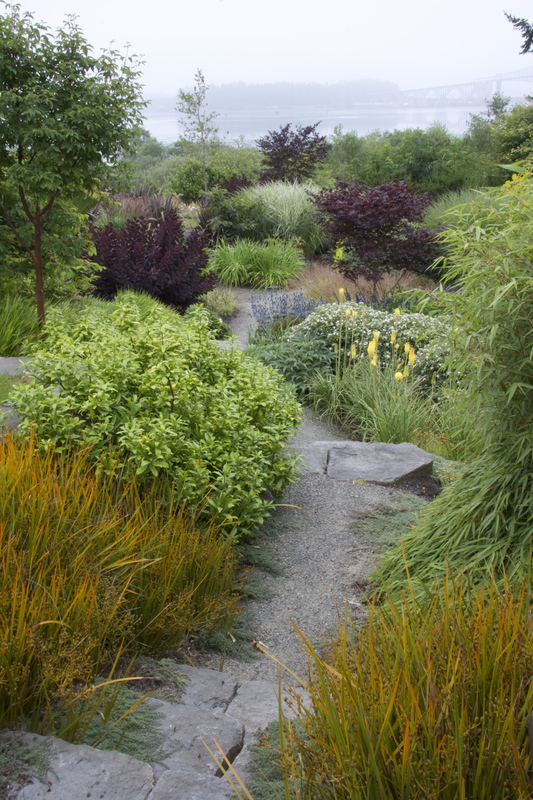 A post featuring the entry of the Summit garden includes some of Buell's terrific photos. You may remember that space from our earlier post here. 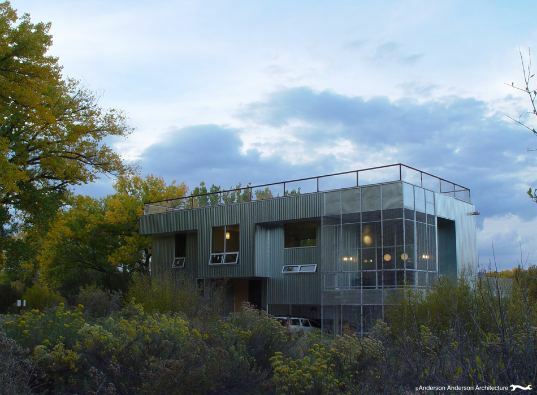 It's an evolving space that will be open for the first time on next spring's Hardy Plant Study Weekend tour. Another fabulous post about a garden shared by neighboring families, the Englishes and the Bascoms, highlights a young and very successful space in the Fairmount neighborhood. There's more to share in each of these gardens, so you can expect to see and learn more in future posts! For now, we're back to stonework in Salem and creating a wonderful new garden that we hope to show you when it's finished and a little filled in. Have you seen the wonderful post about the coast garden on Sunset's Fresh Dirt? I spent a lovely morning there with Jim McCausland, while he shot the photos you'll see in the article (there must be 2000 more!). The Tersignis' garden has been a delight to develop, and we couldn't be more grateful to have such terrific clients and wonderful backdrop. More photos and notes on that garden can be found in some of our earlier posts, many of which are here (be sure to scroll down). And, of course, there are more photos and notes to come! The Dobson Garden on Sunset's Fresh Dirt! Have you seen the Dobson Garden on Sunset's Fresh Dirt? 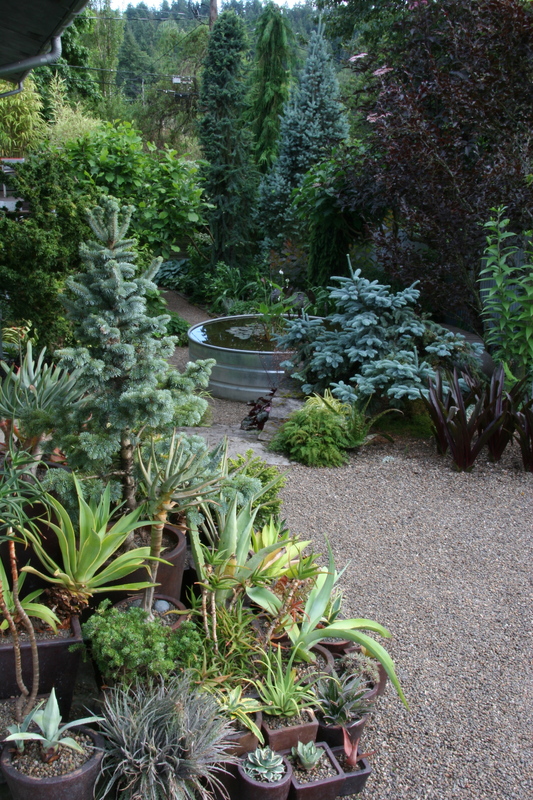 Jim McCausland's terrific article and photos offer a great view of the peaceful courtyard garden. If you would like to know more, check out our earlier post on the space here. Careful observers will note changes between our photos and Jim's. Like any great garden, Ted and Nancy are always refining their space, and we think it's better than ever right now! 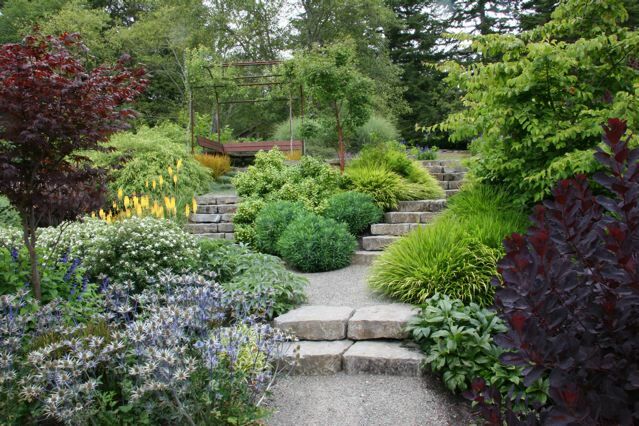 The Dobson garden will be on the Hardy Plant Study Weekend Tour next June. More information on the Study Weekend to come. Isn't it amazing how physical perspective can change a garden? 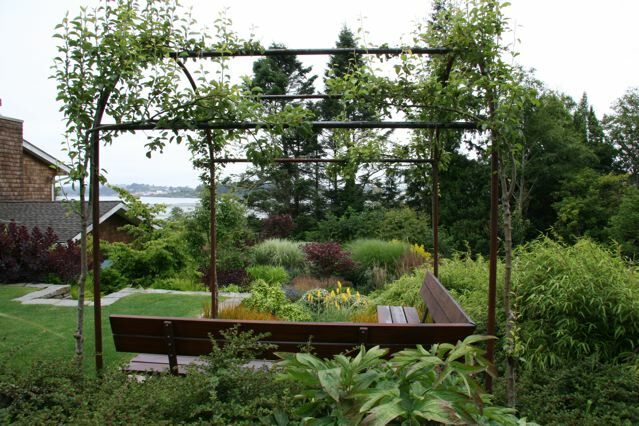 Below are four views of the same section of the garden we built on Coos Bay. It's a busy week in Mosaic central, but we're thinking about you! Just wanted to give you a little taste of a great garden we're going to share here soon.... Stay tuned for more photos and information! 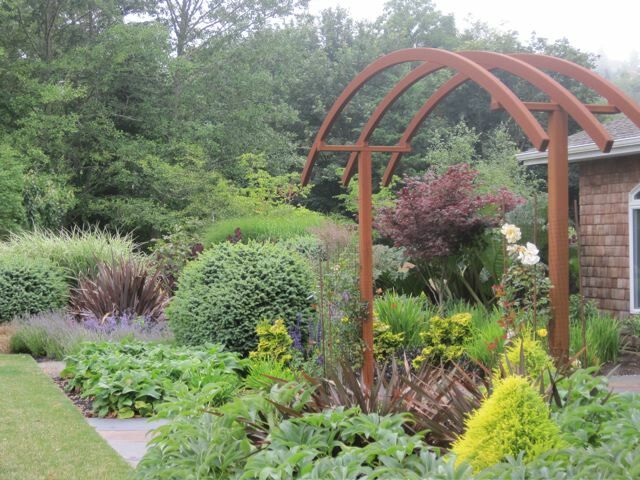 Our artist client, Joy, wanted a romantic, flowery, soft planting, in cool and pastel shades. 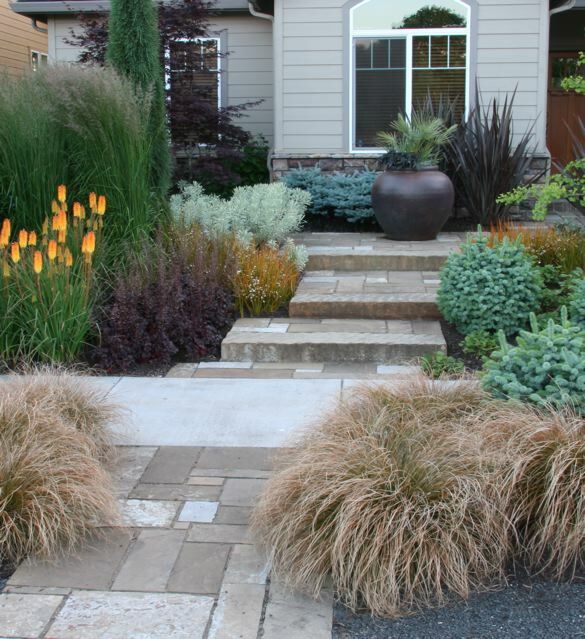 Her original planting - largely thuggish ornamental grasses and traditional landscape shrubs - had never been quite what she wanted, and when she called us, she was hoping for something more in keeping with her craftsman house and painterly aesthetic. We've built the garden in stages, learning the site and its voracious deer as we work our way around. A large Vietnamese urn and basalt pathway in front are two of our rare hardscape additions, as Joy and her husband were happy with the existing patios. As we've moved to different areas of the property, we've adjusted our planting style to accommodate lessons learned and changing preferences. 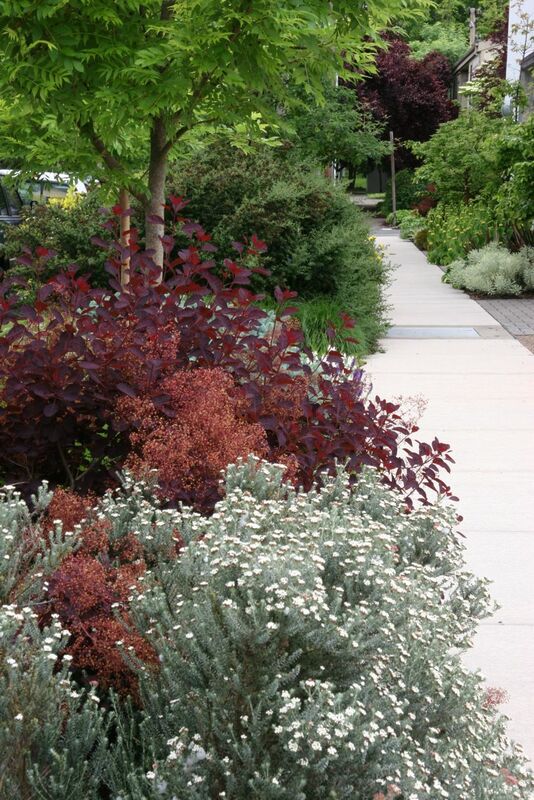 Where spring color was her first priority in the beginning, Joy came to love plantings that provide year-round impact. In addition to our construction work, we develop the garden over monthly visits, through which we've gradually amended our original plantings, creating a garden that looks fabulous in every season, while still reflecting our original aesthetic, and that accommodates the unusual and ever-changing tastes of the local deer. This garden owes a debt to trial-and-error, and we could not be more grateful for Joy's trust in allowing us to bring the garden to its current successful state. We think we've found an elegant balance point between floral color, year-round impact, and, of course, deer resistance. Our highest compliment is that we often find that many of our monthly chores are complete when we arrive, and Joy, who had never been a gardener before, eager to talk about the latest developments and future opportunities. 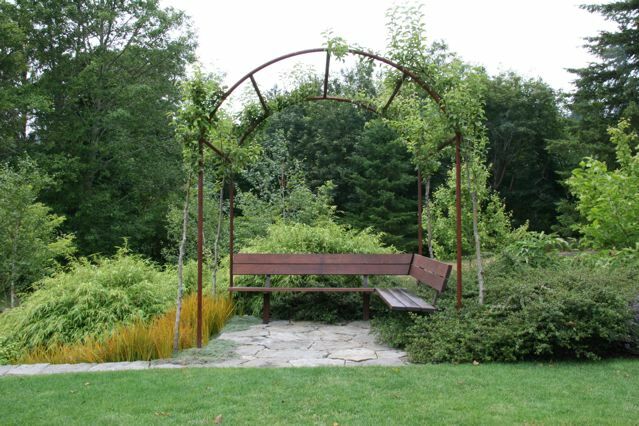 Joy's garden is one of four or five of our gardens that will be included in next year's Study Weekend tour, June 1-3. 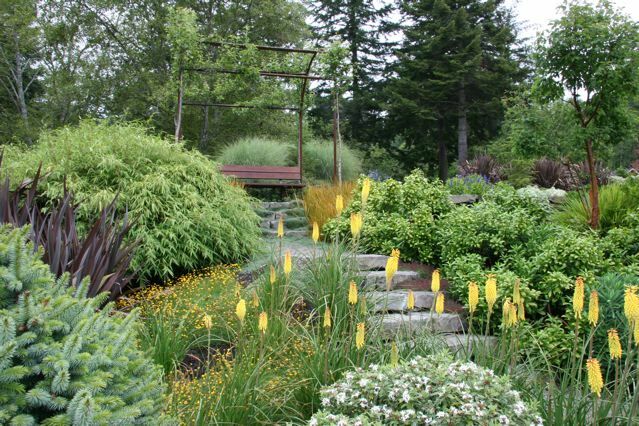 The Study Weekend is a gathering of gardeners that rotates between Vancouver, BC, Seattle, Portland and Eugene, features talks from some of the planet's best plantspeople and designers, and a tour with the areas' best gardens. We'll post more here, as we learn more, but if you'd like to know more soon, please contact the WVHPG. 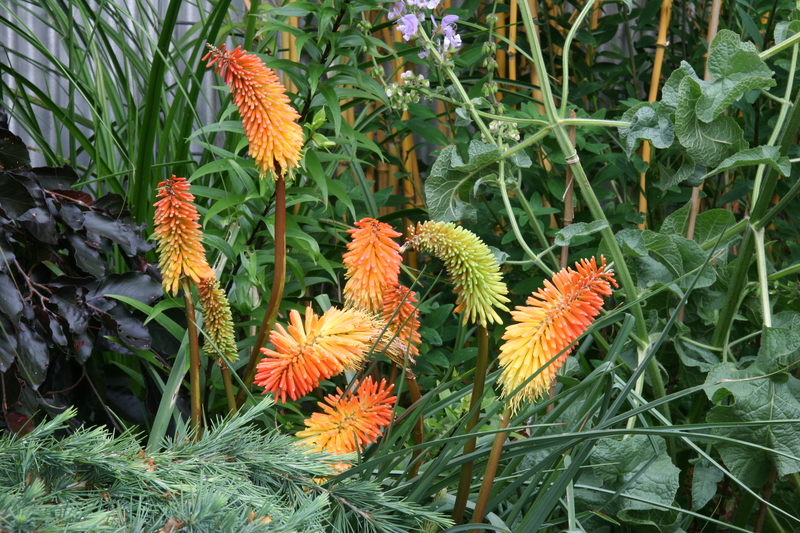 The Ahearn Garden on Sunset's Fresh Dirt Blog! July is off to a great start! In addition to beautiful weather, we had an Independence Day treat of seeing one of our gardens on Sunset's Fresh Dirt blog. 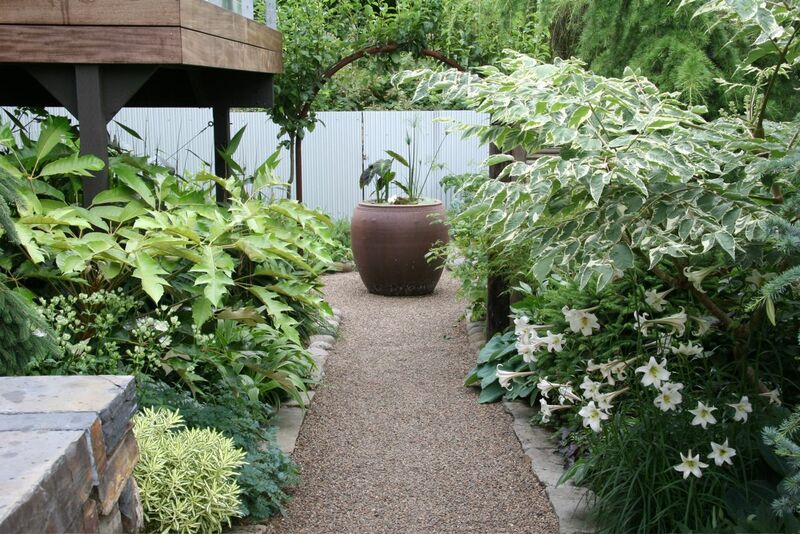 "Perfect Small Patio" by Jim McCausland features Debbie and Gary Ahearn's little courtyard. The patio is an inviting, outdoor extension of their kitchen and dining area. Packing a lot of garden into a small space was our first challenge, and the second was providing a cozy, intimate and private space not far from a well-travelled residential street. The redwood fence balances privacy with a flow of light and air, and the custom metal furniture gives the focus and warmth that make the courtyard a well-used outdoor room. If the Ahearn's courtyard looks familiar, you may remember it from earlier posts in our journal, like this one about outdoor seating areas. Questions? Leave a comment, drop us an email at mosaic@mosaic-gardens.com or ask us in person on Saturday! 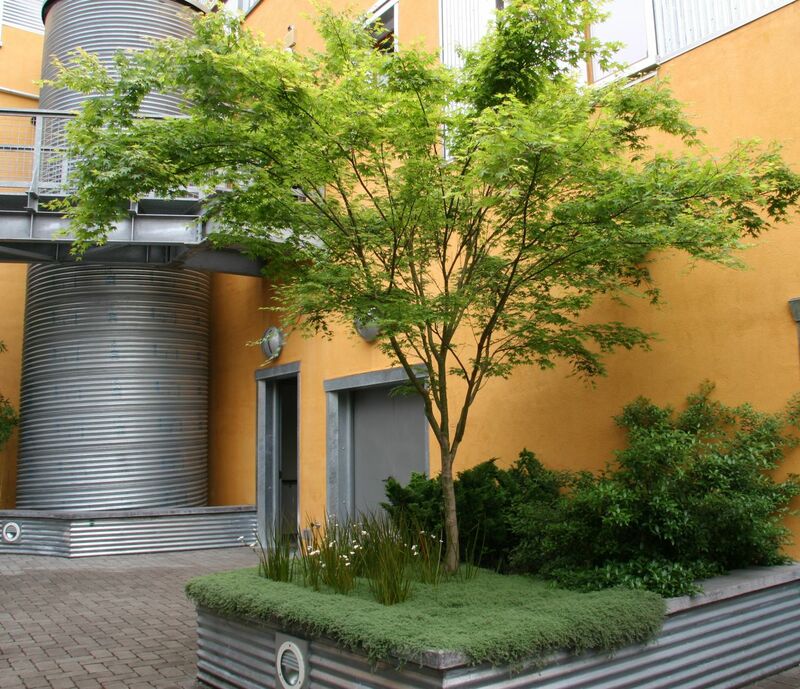 The Watershed is a mixed-use commercial/residential building and a rare exception to our residential garden focus. 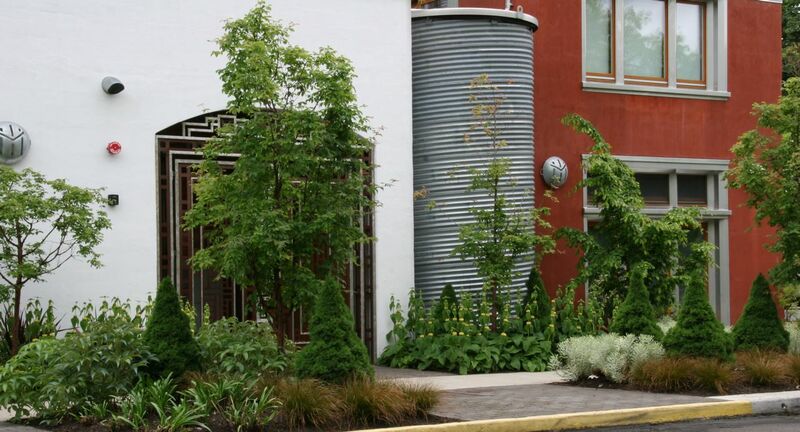 We can't say enough good things about the structure (green materials, local artisans, just fantastic inside and out), and we couldn't be more grateful for the trust that the owners had in allowing us to design and plant their garden. The plantings at ground level and on each of the many terraces are diverse, super resilient, and require very little water from the rainwater catchment system. 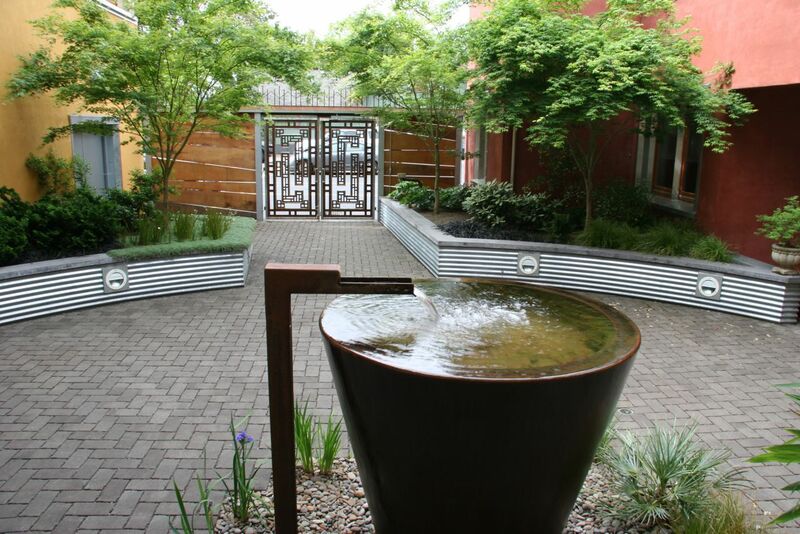 We think that the courtyard and rusting metal water feature are a strong, grounding center to an unusual, beautiful space. Buell took a few new shots of the garden yesterday, and we'd love to know what you think! Have a question? Want more frequent updates? We’d love to hear from you! Read more here and write us in the comments or at mosaic@mosaic-gardens.com. I am in love with the birch tree tunnel -- how beautiful! What type of birch trees are those? What is the system that is holding them up? How would one go about replicating this amazing design? The trees are good old Betula jacquemontii, or Whitebarked Himilayan Birch, a fairly common landscape tree in our area. 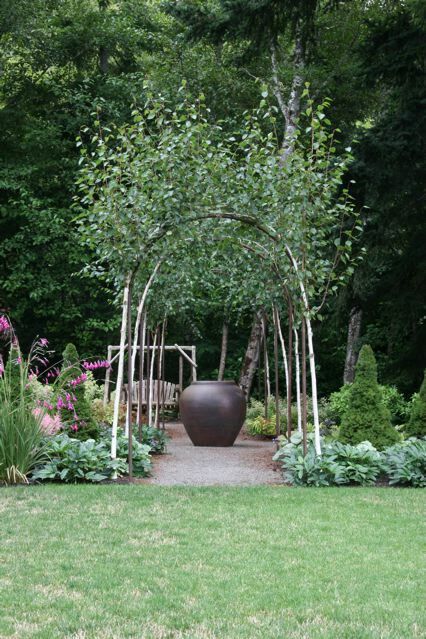 In this shadier area of the garden, we wanted the trunks of the trees to stand out, and this birch had both the eye-catching light bark and the tolerance for cool, moist (but well-drained) soils that we needed. We should note that this is the first time we've used this tree for this application, so it isn't yet "proven," but, as you can see, so far so good! The structures are round steel tubes that we had bent to a specified radius. Believe it or not, there are shops dedicated just to bending metal! If you wanted to replicate an arch like this, you can talk to a pipe bending company or you may have better luck a local metalworker who can oversee the project for you (most pipe benders are not accustomed to working with homeowners). Alternately, you may be able to carefully fabricate a supporting structure from a smaller diameter metal, such as rebar, but it is very difficult to get and keep a perfect curve and straight sides. No matter what your method, be sure to make the "legs" of your arch extra long, in order to sink them below grade in concrete. Design-wise, this is obviously not a new concept. For centuries, landscape designers have understood the power of focusing attention with geometry, and our take on the allee is nothing new. When considering a feature with this aesthetic weight, it is vital to get your lines just right. Make sure your "tunnel" is straight and centered, and carefully consider the views or focal points at the ends. This is our only allee, but the balance of soft and hard lines in a metal arch can create a striking effect in many spaces. Below are a couple more photos of arches we have created. If you missed it, you can get another view of the arches in our last post. Thanks for the questions, Brooke! We brought out the big camera this time. 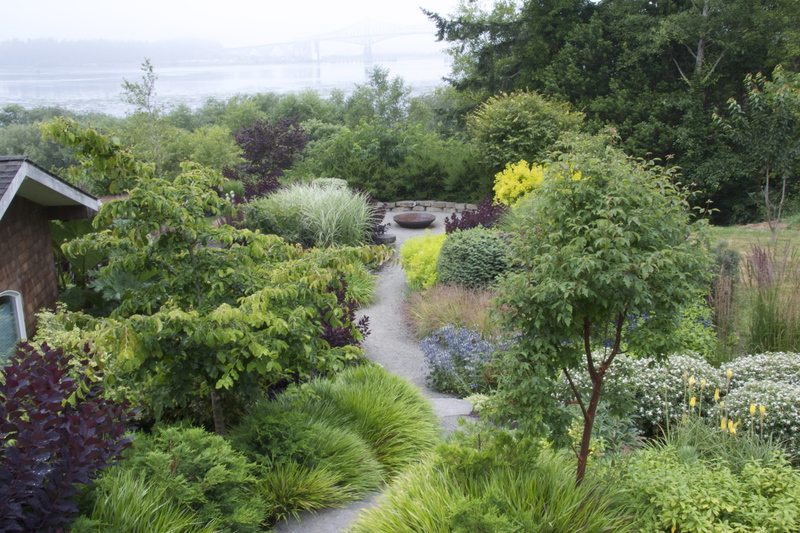 Here are a few of our favorite potential portfolio shots of the Oregon coast garden. What do you think? Happy July! It's a busy time of year for Mosaic, but we've managed to add quite a few ideas and photos to the journal since the last newsletter. 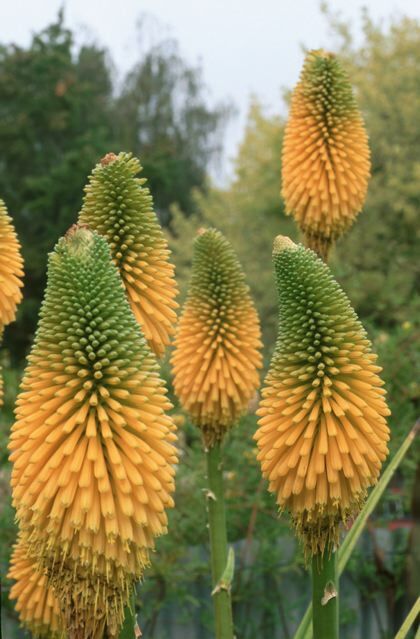 We discussed everything from our visit to the Ruth Bancroft Garden, to selecting containers for planting, to gardening with feathered and furry friends in mind and much more. Be sure to scroll through the journal when you're done here! Stone is an essential element in much of Mosaic's work. One of our main reasons for being a design/build company is the intricate connection between form and function, and nowhere is this more important than in stonework. This newsletter shares some of the lessons gathered in years of working with stone. Whether you're an aspiring DIY stonemason or looking for the right pro to help build your hardscape, we hope this article will bring some inspiration and direction to your search. 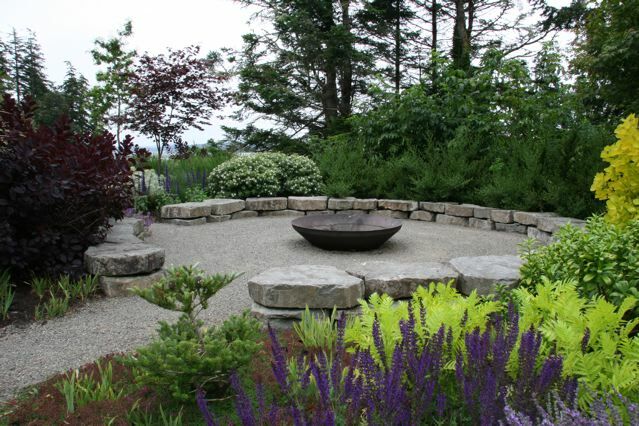 When designing a garden, setting the overall layout of the hardscape is our first priority. Whether we're creating scaled drawings or just hand-waving, we seek to create a unified plan that balances the desired feeling of the garden with the limitations of the site, such as grade, dimensions, and relationship to the house. We try to design an entire space, say a front yard, at once, even if we only intend to build a portion of it immediately, so that we can be sure that the first phase ties into the following phases. We save all materials decisions until everyone is happy with the overall layout of paths, patios, walls and borders. Once the general design has been set, decisions about which stone to use often fall into place. Aesthetic preferences play a big role, but the stone's desired function comes first. On important pathways, we generally select a very flat stone, with few surface irregularities to catch high heels or make less able visitors uncomfortable. A stone with a regular surface is a good choice for most patios, as well, as it is easier to de-wobble tables and chairs on a flat surface than one with more bumps and dips. Of course, a rougher stone can a beautiful choice for many spaces. 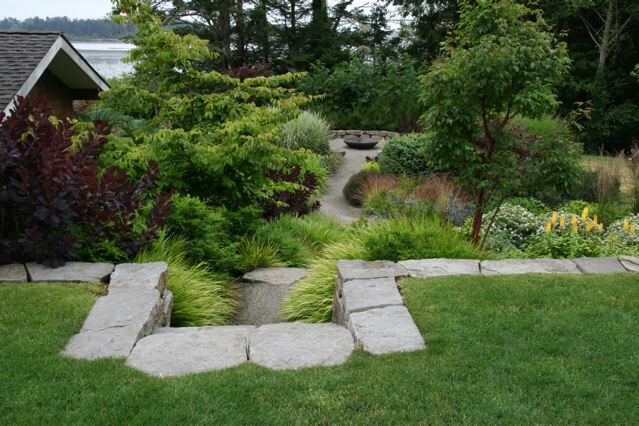 In some gardens, we use a rougher stone in secondary paths, and a flatter stone for primary entrances and paths. If your heart is set on a rougher stone look, there may be a way to use it if you're careful in selecting, laying out and setting each stone. 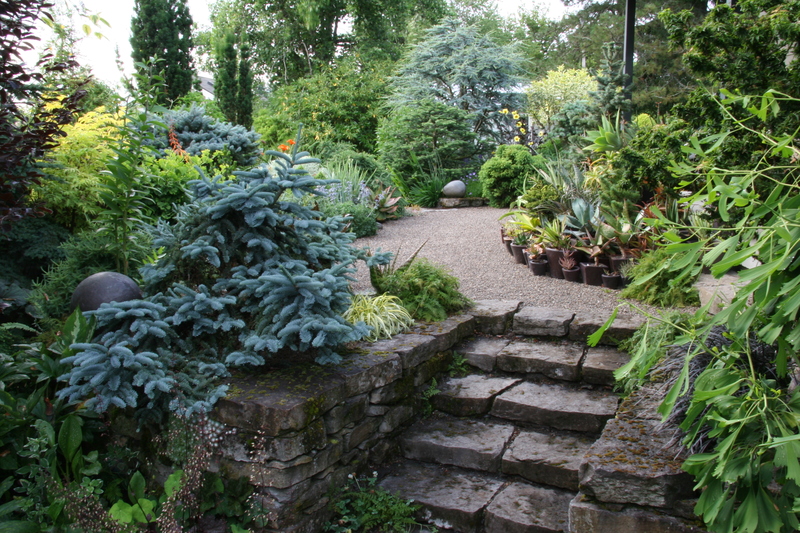 In our garden, we wanted to find a single type of stone from the Pacific Northwest that could be used for paths, walls and stairs - a tall order! 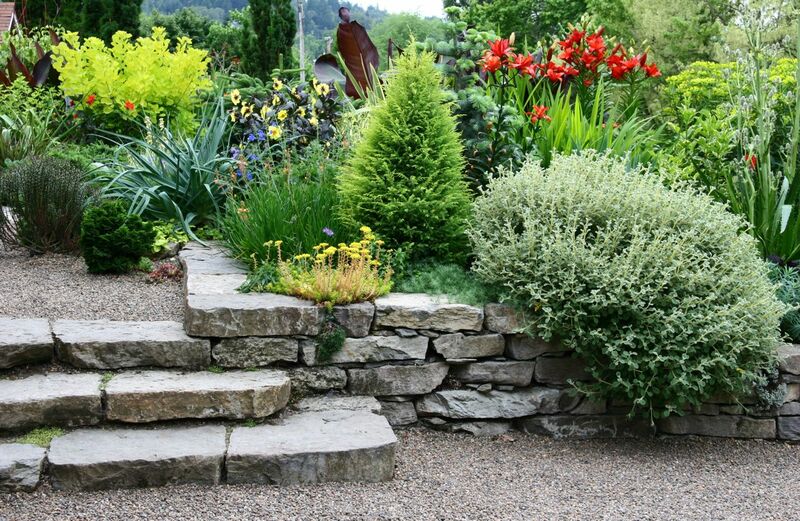 At the entrance to our garden, we have a very few steps of the slightly rougher basalt that we chose, but we hand picked the best possible stones for each step. 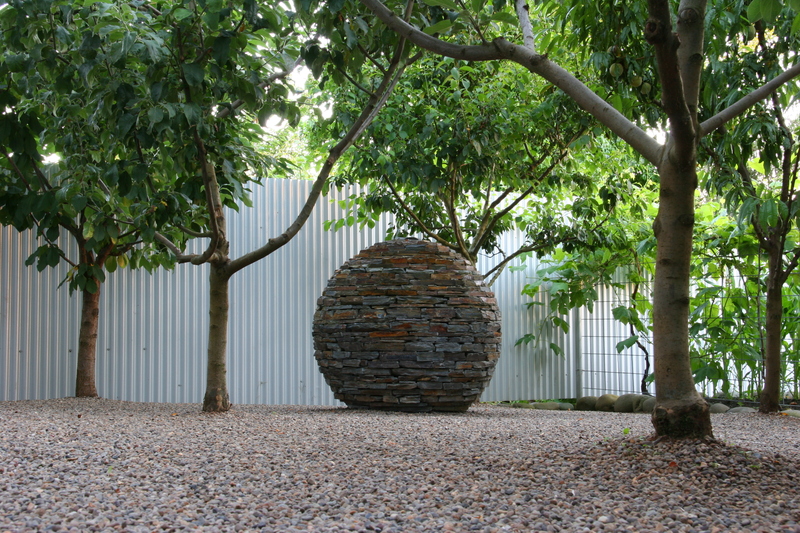 While a stone may look perfect in photos or at the stoneyard, no natural materials just fall into place, and some are a major challenge for a novice stonemason. Regularity of shape and surface, workability and average size vary between varieties of stone, and each characteristic presents its own challenges and opportunities. Average size is a good example. Small stones are easier to move, but they are more difficult to stabilize. 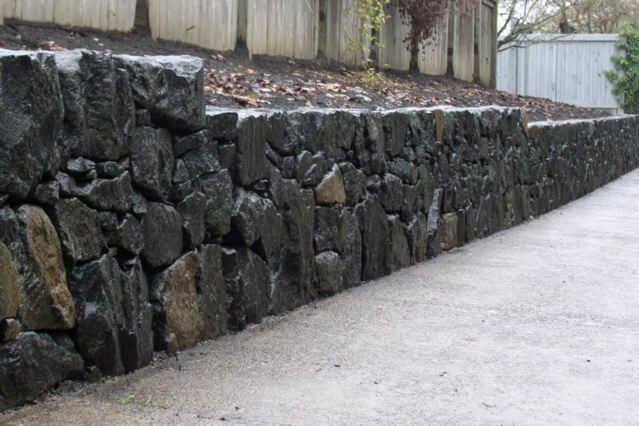 Discuss your options with the knowledgeable folks at your stoneyard. Be honest about your skill level, the amount of time you can dedicate to the project and the tools you have or are willing to rent or buy (some stones can only be cut with a big, heavy, gas-powered wet saw - not for the faint of heart!). Don't be offended if they suggest that you consider a man-made product, as those options are quicker, lighter, and all-around easier for the first-timer. That said, we've seen some pretty darn good natural stonework by amateurs who were willing to dedicate the time and attention to detail their stone demanded. Once you've taken function and ease of construction into consideration, you may still have a few stone options for your project. Color is an obvious consideration, but don't forget to consider other attributes, such as the regularity of the pattern, the general size and texture of the stones, and the materials and colors of surrounding features, such as your house. Base - Every stone project requires a solid foundation. In most cases, several inches of compacted sharp gravel is a good start, but discuss options and additions for your particular stone project. We often spend hours preparing our site before we lay the first stone, from setting the grade to excavation, moving base, grading, compacting, grading, compacting.... There is an unfortunate proliferation of "expert" advice floating around that claims you can more or less plunk stones on essentially unprepared soil. Ahem. Don't. Unless you're just not interested in the long term longevity of your work, do the base work. Careful layout - String lines are your friend. They make sure that your straight lines are actually straight, keep you at the right grade, and make for impeccably level walls. Make sure that water runs away from any structures and that the slope of your paths or patios are appropriate for their purpose. Tight gaps - We know of no better visual indicator of quality than consistently tight gaps in stonework. By taking the time to shape and place stones so that they leave little room between them, you lock the stones in place, creating a longer-lasting, stable product that is pleasant to walk on and beautiful. There are moments when a "stepping stone" effect can be nice, but we reserve this option for infrequently traveled areas. Stability - The wobble test. Even the best stonemason may have to re-stabilize a flagstone or two after their work is done, but the vast majority of stones should not move underfoot. Borders and the top stones of walls should also be firmly set. Dry setting - We rarely use mortar in walls and never in laying flagstone. Any good stonemason's work, mortared or not, is grounded in careful dry setting technique. Sometimes using mortar is preferable or necessary, but good, stable stonework should still be the foundation of your project. Time - The variation that makes natural stone so beautiful also demands thoughtful, sometimes slow work. Each stone requires a different approach, with an eye towards not just fitting into its space, but making the right platform or hole for the next stone. The rewards come slowly, but they do come, and, in the long run you will be happier with a well-built project than a quickly built one. Dan Snow, the New England stonemason quoted in the "goals" section above, offers a much better and lengthier source for "how to" information than we can provide in our journal. His book In the Company of Stone is both a gorgeous collection of stonework photos and an invaluable resource. If you have a moment, check out his website and Flickr stream for lots of neat process photos. We can't recommend Lane Forest Products highly enough. They are a great source and resource for your stone projects, and they offer a great selection of materials for any project. Their stone yard crew is pleasant and professional, even in scorching heat, and we're always happy with the quality of their products. Last, but, we hope not least, we've put a small sampling of Mosaic's stonework and a slideshow of the construction of a dry stack wall (rerun from this post) below. See if we measure up to our own standards! Click on the images in the gallery for a closer look. A quick blast of water in the heat of the afternoon cools the plants and hardscape down a bit. With our cool nights (ahh, those cool nights), we only have a few really broiling hours, and a little cooling can go a long way towards preventing burned leaves and miffed plants. It's still best to do your main watering in the early morning, but a couple of minutes of well timed water in the afternoon can be a big help. Plant a few summer performers that actually enjoy a little heat. These plants may take awhile to come on strong, but they love the weather we're having right now, and will thrive through fall. One annual we love is Solanum pyracanthum - a sort of mean-looking spiky tomato. 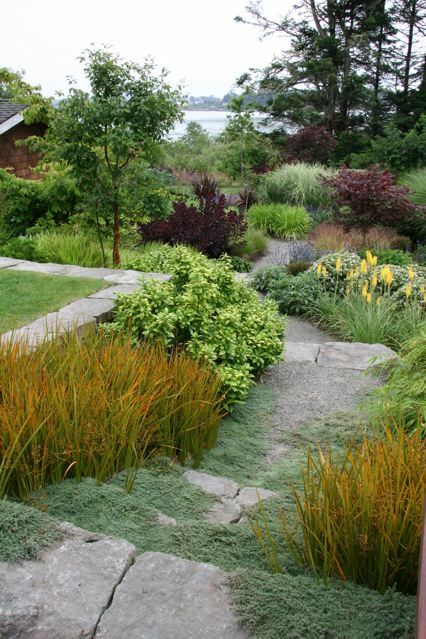 Resolve to work towards a lower water garden. 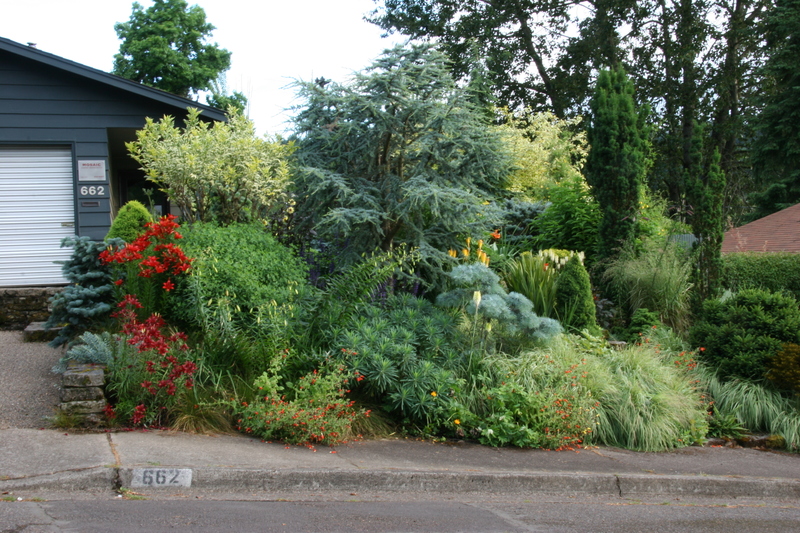 Drought tolerant plants tolerate heat better than their hydrophilic counterparts, and you don't have to water them every day in a hot spell to keep them from collapsing completely. Enjoy the heat, if you're a heat lover, and happy hiding if you're not! We're still working on your newsletter. We're sharing some tips and ideas for selecting and working with stone, and we think it will be worth the wait. We also love the quiet, let-it-be landscape (much easier with pre-fab). Why mess with a good thing? 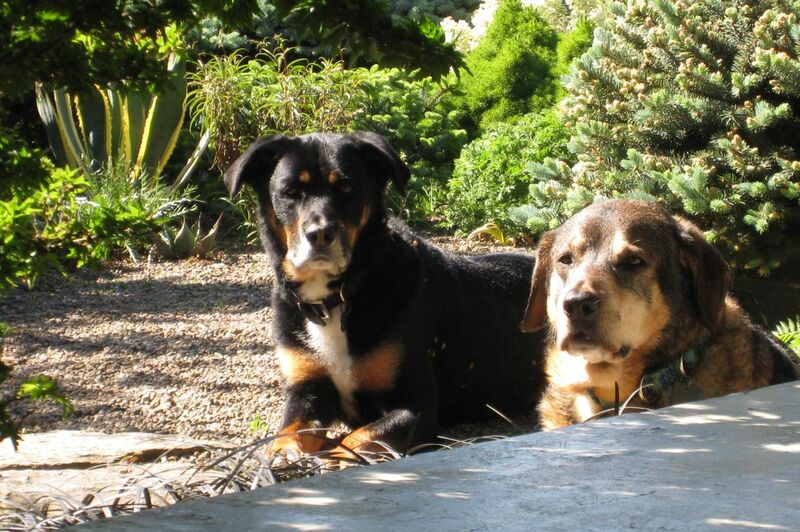 Like many of you, we love our garden and we love our pets, two big mutts, Moso & Faro, and we know that it can be hard to find the right balance between freedom for the dogs and a tidy, happy garden. When designing spaces for other dog-lovers, we sometimes include a separate fenced area for the pooches. The separate area to romp and... take care of other business... keeps the dogs contained and the plants free from pee-burn, trampling and munching (even well-behaved dogs *love* ornamental grasses). There's no reason to give up on good design in a dog area, however. Our dog run doubles as an orchard, and we grow grapes on the bull wire fence that separates the space from the veggie garden. The pea gravel is easy to clean, and it doesn't track in on wet paws. So far, we've only designed "dog gardens," but judging from this New York Times article and slide show, we may get a chance to design a "catio" one day. We find some of the enclosures in the photos a little aesthetically overwhelming, but we're sure that there are more subtle options. While the article focuses on the benefits for the cats, there are advantages for birds and other native wildlife, as well.